For those of us who suffer from, as Mel Brooks would call, “High Anxiety,” cycling over a bridge can be an interesting experience to say the least. For me, my high anxiety is intermittent, since I have no problems on most bridges. 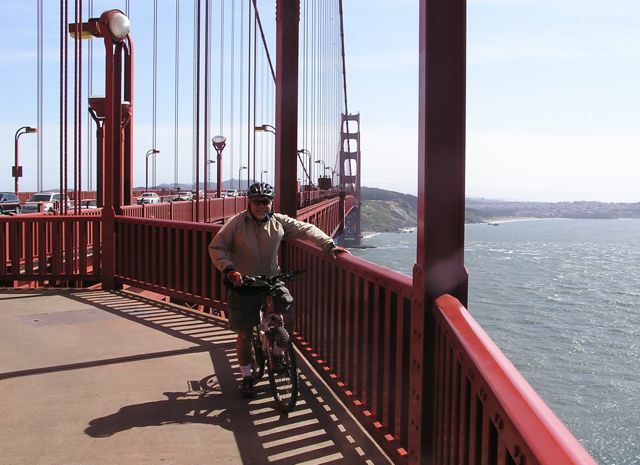 However, cycling across the Golden Gate Bridge, one of the marvels of the engineering world, can be quite the test for anyone with this condition. The bridge is definitely HIGH at 220 feet above high water, long at 1.75 miles, and winds can whistle around the support structures at 50 mph. 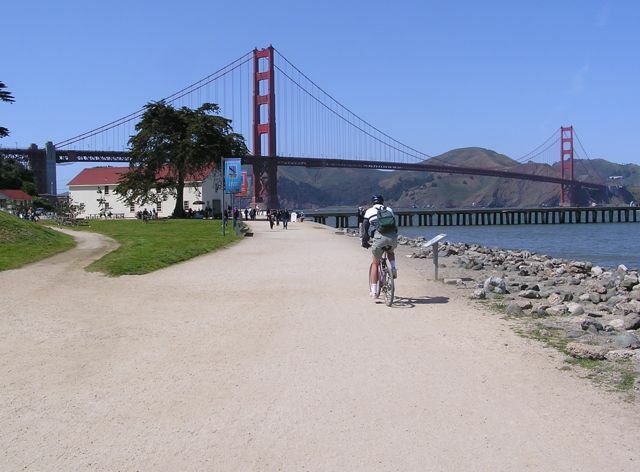 Still, on weekends the wide west sidewalk is a bicycle highway, with San Francisco road cyclists zooming across to get to the challenging terrain of Marin County. There are plenty of casual cyclists like us as well, and bike rental concessions such as Blazing Saddles outfit tourists with a map to get them along the beautiful city waterfront, on bayside bike trails past the Marina District, up to the bridge, and then down the other side and to the lovely town of Sausalito where ped/bike ferries await to return riders to The City to complete the loop, sometimes with a wait on the busiest days. It is definitely one of the most scenic and stimulating easy rides anywhere. 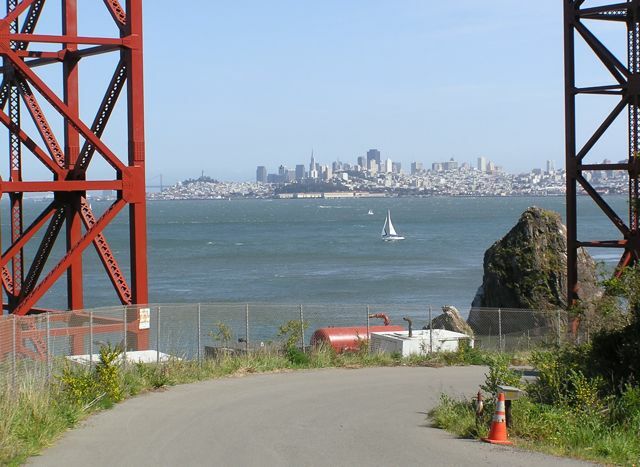 The views from the bridge back toward The City, the cliffs of the Marin Headlands and the bay and ocean are astounding. And from everywhere else, looking at the bridge creates a dramatic backdrop to the scene. 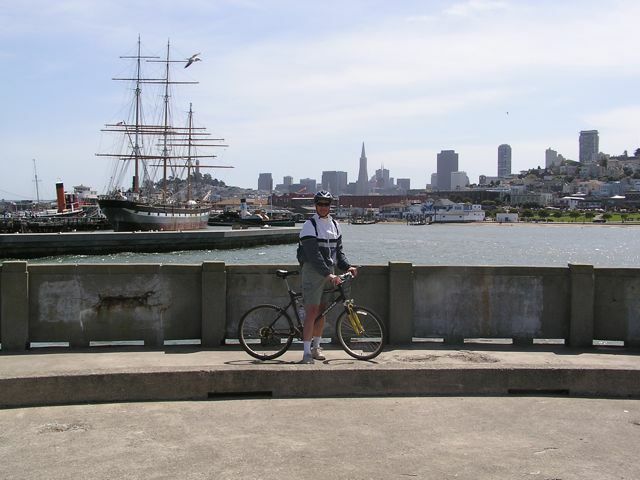 There’s a bit of city cycling involved around Fisherman’s Wharf, but we found that manageable. On the north side of the bridge, we always cut down under the bridge and through scenic Fort Baker, leaving only a minimum of scary downhill road riding between there and Sausalito. 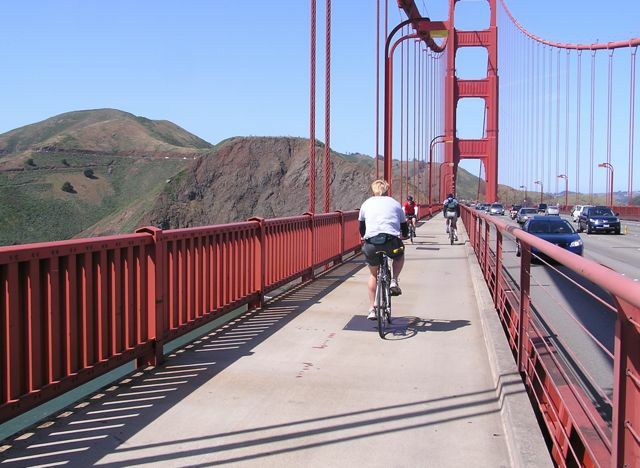 Cyclists cruising across the Golden Gate Bridge. Bike trails on the approach to the south side of the bridge. Pausing along the route at the San Francisco Waterfront. The path down under the bridge on the north side en route to Fort Baker and then Sausalito. 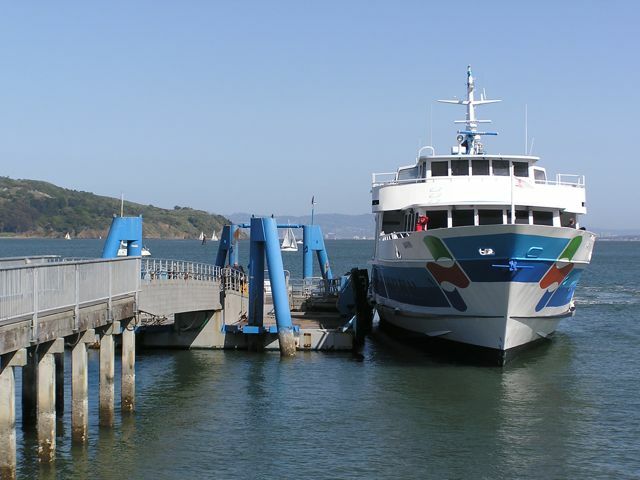 The ped/bike ferry waiting at Sausalito. City skyline as seen from the ferry. 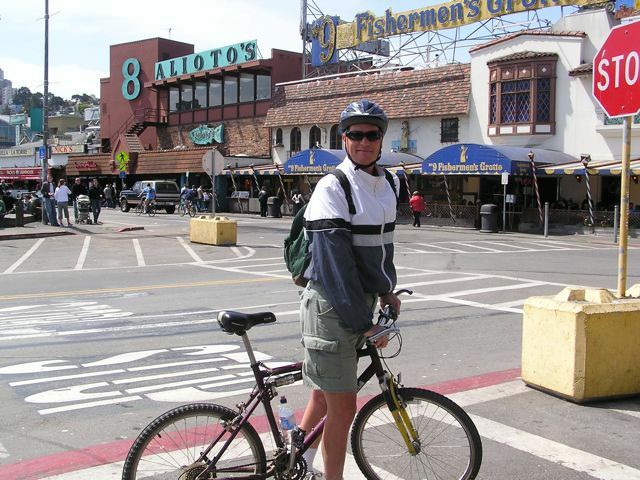 Steve at the famed Fisherman’s Wharf district. Thank you for sharing this bike ride. It looks like a fun, mostly mellow ride, just my style. I need to get there to try it out. It’s great! 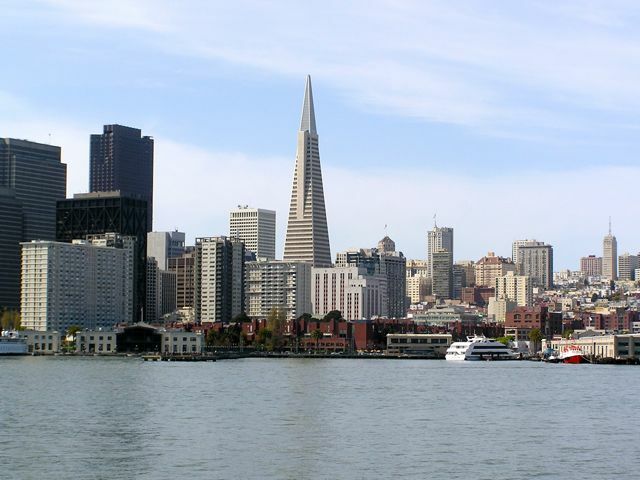 Just be careful on the road sections and allow lots of time for exploring Sausalito, maybe eating there. Also google which days the bridge authority designates certain sidewalks for bike-only to make it the best ride. Otherwise you have to dodge picture-taking tourists.